How To Properly Water Your Lawn | Maple Leaf Lawncare Inc.
Avoid hand watering because it cannot provide uniformity. The only possible exception to this guideline would be the need to water the surface of the grass to cool it, or to provide additional water near buildings or other beat-reflecting surfaces. Understand each sprinkler has its advantages and disadvantages. Proper use is determined by the type of sprinkler you select. IN-GROUND SYSTEMS require professional installation, routine adjustments and proper maintenance to be effective. The greatest mistake made in most in-ground systems is the “set it and forget it” philosophy that fails to account for changing seasonal water requirements to maximize turf growth or allows the system to operate following an adequate rain. Another frequent problem is when the sprinkler heads get out of alignment and apply water to the sidewalk, street or house-sliding rather than to the lawn. HOSE-END SPRINKLERS range in complexity, cost and durability, but are portable and can provide uniform and consistent coverage when properly placed and maintained. During the growing/watering season, perform routine maintenance to check for blocked outlets, leaking or missing gaskets and misaligned sprinkler heads. Water uniformity can be accomplished by simply using 4 to 6 empty flat bottom cans (tuna fish, cat food, etc. ), a ruler and a watch. STEP #1 Arrange cans at random distances from any sprinkler. STEP #2 Run the sprinkler for a specific amount of time, or until there is at least a 1/2 inch of water (1.3 cm) in one can. STEP #3 Measure the amount of water in each can. 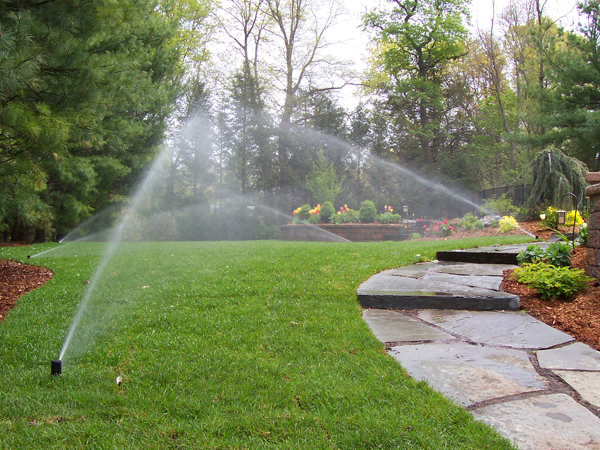 Some variation is expected, but a difference of 25-30% or more between any two cans will require adjusting or relocating the sprinkler. Watering difficult areas such as sloped and under trees requires special attention to achieve maximum coverage and uniformity. For Slopes refer to Watering Tip #3 from our article, “6 Essential Tips For Watering Your Lawn”. For areas under and near trees you need to know the specific water requirements for trees as well as grass. Despite having deep “anchor” roots, trees take-up moisture and nutrients from the top six inches of the soil and compete with the grass for moisture. Watering sufficiently for the grass may, in some cases, result in the over-watering of some varieties of tress or too little water for other varieties. A common solution is not to plant grass under the drip-line of trees, but rather use that area for perennial ground covers, flower beds, or mulch beds. The amount of water your lawn requires and receives will determine its overall health, beauty and its ability to withstand use and drought. Keep in mind that too much water can ruin a lawn just as fast as too little water. One inch (2.5 cm) a week is a watering “rule of thumb” (by rain or watering) suggested for most lawns; however, this will vary between different turf species and even among cultivars within a specie, seasonal changes and different soil types. Look at your lawn to determine its water needs. Grass in need of water will have a grey-blue cast, rather than a blue-green or green color. Also, footprints will still appear after a half-hour or more on a lawn in need of water, while on a well watered lawn, footprints will completely disappear within a few minutes. Inspecting your lawn frequently will help you determine its water requirements and avoid either over or under watering. Water timers can help provide consistence and even be pre-programmed to turn on or off. Some times measure the amount of time water flows through the device, while others measure the number of gallons used. Read the directions with the timer to determine proper operation.